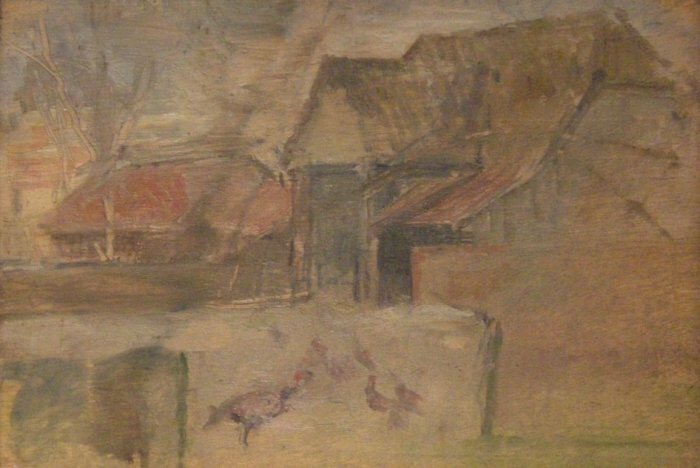 This work is one of two paintings produced by Coldstream during one of his many trips to stay with the artists Rodrigo and Elinor Moyniham at their farmhouse in Monksbury, Hertfordshire. It was here that he met and began a relationship, which would last until 1941, with Sonia Brownell, after separating from his wife, Nancy. Farmyard, nr Monksbury, c.1939-40, was painted during one of these weekend visits with Sonia and was given to her by the artist, undoubtedly as a token of his affection. Sonia Brownell is today well known as Sonia Orwell the wife of writer George Orwell.